Puppy mouthing is one of the most common complaints new owners of puppies make and one of the most challenging problems they often have to deal with. However, with a few different approaches to suit different personalities of dog, it is usually possible to resolve this problem and teach your puppy better ‘mouth manners’. First, it’s important to understand that mouthing, chewing, gnawing and nipping are quite natural behaviours in dogs, especially puppies. It is how they play, interact and communicate with each other. In fact, dogs use their mouths much like how we use our hands – and to a puppy, mouthing is often a way of exploring the world around him, much as a human toddler is likely to pick up anything in his hands. Mouthing is also the way they get attention – much like how we would tap someone on the shoulder with our hands, although of course, the key is to teach a gentle tap and not a big whack! Or better yet, a different, non-physical way of getting attention. Another thing to remember is that puppies are usually teething therefore they have a strong instinct to gnaw and chew on things, with the sensation bringing them great relief, thereby making it self-rewarding. Basically, chewing on things feels good! This is why many dogs become destructive chewers. You cannot stop this urge altogether therefore it is better to redirect it onto more appropriate objects. If you watch any group of puppies at play, you will see a lot of mouthing going on. If one puppy bites on another too hard, there will usually be a loud YELP and all play will cease for a minute. This teaches the mouthing pup that he has exerted too much pressure and that he needs to learn to control his bite if he wants to continue enjoy having playmates. Thus, puppies learn ‘bite inhibition’ and how to be gentle with each other this way. 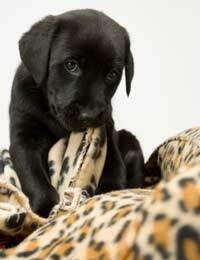 It is believed that puppies that are removed from their litters too early, such as before 6-7 weeks may have trouble learning bite inhibition because they have not had the benefit of such experiences with their littermates. Therefore, many behaviourists and dog trainers believe that rather than teaching a puppy not to mouth at all, it is actually more important to teach the puppy to mouth GENTLY first. This way, the dog will grow up learning how to control the pressure in its jaws and will develop good bite inhibition, something which can prevent serious injuries should the dog ever be tempted to bite later in life. To teach bite inhibition, basically emulate another puppy – so let your dog mouth you but when he bites too hard, let out a loud YELP and immediately stop playing and ignore the puppy for 10-20 seconds. Then resume playing again and repeat if he bites too hard again. It is important to go back to playing so that he understands that play will continue if he is gentle and also so that he has a chance to repeat his mistake and learn from it again. However, if you are having to repeat this more than 3 times in 15mins, then this method is likely not effective and you’re better to try something else. However, in most cases, the loud YELP will startle the puppy into pausing and after a few repetitions, he will soon begin to understand the consequences of biting too hard. If yelping simply gets your puppy more excited, you can try a loud “NO!” said in a firm voice. Do not try to push the puppy away or hit him or physically punish him in any other way – the key to success is the withdrawal of attention since this is what the puppy was trying to get with his mouthing in the first place. In some cases, the puppy will continue to try and bite you even after you have turned away and removed all attention. In this case, you may need to put your puppy away into a puppy-proof “Time Out” area (or leave the room if you can safely leave your puppy in there). Alternatively, you can leave a leash attached to your puppy and simply tether him to something and leave him there to cool down. If he has a ‘temper tantrum’ while in his time-out, do not go to him or give him any attention, otherwise he may learn that crying and making a fuss will get him what he wants. Wait until he is quiet and calm again before releasing him. Once you have taught your pup to modulate his bite and control his jaws, it is now time to take the next step and teach him that dog teeth should never come into contact with human skin altogether. So follow the same steps as above but where previously you might have allowed gentle mouthing without reacting, you now raise the bar and react for ANY contact of teeth on skin. Your puppy will quickly realise that he is not allowed to use his teeth on any part of your body, no matter how excited or playful he is feeling. To help him, you should also give him an appropriate alternative to fasten his teeth on. So keep a variety of chew toys around the house and when your puppy tries to mouth you, immediately interrupt his behaviour and then redirect him onto one of his chew toys and give him lavish praise for showing it any attention. Eventually, the dog will learn to always seek out a chew toy whenever he gets the urge to mouth something.